One of the greatest villains in English history is King Richard III. 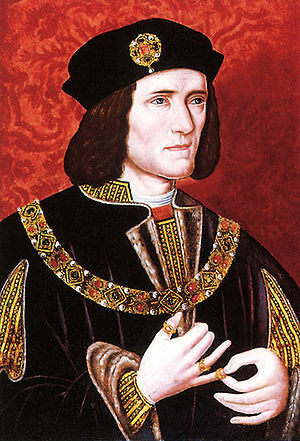 Richard III reigned from 1483 until 1485, and his death ended the War of the Roses, fought between the Lancaster and York branches of the Plantagenet dynasty. His brother, Edward IV had largely won the war with a Yorkist victory and the near extermination of the Lancaster family by 1470. Edward died in 1483 at the age of forty, leaving behind his twelve year old son to rule as Edward V.
Richard was named Lord Protector and acted as regent to the young king. He kept the family of Edward IV’s queen, Elizabeth Woodville out of power and had her brother, Anthony Woodville, and other supporters arrested and eventually executed on a charge of plotting to assassinate him. He also took the young king and his brother to the Tower of London, ostensibly for their safety. Before Edward V could be crowned, the Bishop of Wells and Bath told Richard that Edward IV’s marriage to Elizabeth Woodville was invalid because of a previous secret marriage. This made Edward V illegitimate and Richard the rightful king. The young princes in the Tower disappeared and it was widely believed that Richard III had them murdered. Historians are not certain whether Richard did indeed order their death or even if they were murdered at all. Despite his later reputation as an evil, treacherous man, he served his brother loyally and was entrusted with the government of northern England. It is not really clear that he intended to usurp the throne. He may have believed himself to be the rightful king if Edward IV’s sons were really illegitimate. He may also have felt that a minor on the throne in a time of continuing political unrest would be harmful to the country. Richard III does not appear to have been a bad king. He had a reputation for defending the commoners against the oppression of the nobility both under the rule of his brother and as king. He was actually quite popular in some quarters, especially in the north where he had ruled. On the other hand, the disappearance of the princes and the suspicion that he had murdered them turned people against him. There was also another contender for the throne, Henry Tudor who was living in exile in France. Henry Tudor was descended, on his mother’s side, from the Lancasters. He tried to invade England in 1483, but the attempt was unsuccessful. He had more luck in 1485 when he led an army into his ancestral home in Wales. He fought and killed Richard III at the battle of Bosworth Field and then became King Henry VII, founding the Tudor Dynasty, finally ending the War of the Roses. Naturally, the Tudors wished to present Richard III in the most unfavorable manner possible. He was depicted as a power-hungry and treacherous king, the villain who usurped the throne and murdered children. Henry VII was the hero who freed England from the tyrant. William Shakespeare followed the Tudor party line in his play Richard III. He could scarcely do otherwise since Henry VII’s grand-daughter Elizabeth I was queen for most of his career. Shakespeare depicted Richard III as a deformed hunchback, dishonest, immoral, and being evil just for the sake of being evil. As Shakespeare has Richard say in the beginning of the play. But, now, Richard III may be due for a rehabilitation of his reputation, according to a story I read in USA Today. The discovery under a parking lot of a battle-scarred skeleton may restore the reputation of arguably Britain’s most maligned king and lead to a royal burial five centuries late. “There has been a lot of debate on almost every aspect of Richard III’s life, appearance, personality and death,” said historian John Ashdown Hill, whose book, “The Last Days of Richard III,” explores the final 150 days of the king’s life before he was killed in the Battle of Bosworth Field in 1485. “The remains won’t clarify everything, but they will be part of the process of getting back to original, authentic, documentary evidence rather than being misled by the propaganda that spread after his death,” he said. “Tudor sources say he had a withered arm but when I went to look at the skeleton the other day I couldn’t see much difference in the length of the arms,” he said. Historians also say there is proof that he wasn’t a hunchback. The remains were dug up this month by archaeologists looking for the ruins of a medieval monastery under a parking lot in Leicester. They found a skeleton with a metal arrow in its back and what appeared to be a severe battle injury to the skull, injuries that are consistent with the historical accounts of how Richard III was killed defending the ruling House of York against Henry Tudor’s House of Lancaster. The skeleton also shows curvature of the spine, consistent with reports of Richard’s appearance that say he had one shoulder higher than the other. His death brought about the end of 300 years of Plantagenet rule and the start of the Tudor dynasty, which governed England and Wales for 117 years. But history is written by the victors and few, if any, monarchs have been cast more malignantly than Richard III. There is actually a society dedicated to restoring Richard’s reputation. The Richard III Society, a 3,500-strong group of academics and others dedicated to challenging negative portrayals of him, the medieval king, say Richard was a victim of Tudor propaganda. “Henry Tudor had to discredit Richard in order to justify his taking the throne,” said Lynda Pidgeon, research officer with the society. She hopes the discovery will spark an upsurge in interest and lead to a more objective writing of history. Meanwhile, a British parliamentarian says if the remains are indeed the king’s, they must be given a state funeral with all the pageantry that entails. In order to learn whether or not the skeleton is Richard’s they will have to compare its DNA, if it can be extracted, with a descendant of Richard’s family. They have found one in Canada. First, though, the remains must be positively identified, and the responsibility for this rests with one man. Michael Ibsen, 55, is a 17th-generation descendant of Anne of York, Richard III’s sister. Originally from London, Ontario, he has lived in London, England, for nearly 30 years, and if DNA can be extracted from the skeleton, it will be compared to Ibsen’s to see whether there is a match. The first that Ibsen heard about his royal heritage was from Ashdown Hill, whose quest to discover Richard’s descendants led him to Canada and Ibsen’s mother, Joy, in 2004. Joy Ibsen died in 2008. Michael and his siblings are the last living descendants able to provide the type of DNA that has the best chance of proving whether the remains are Richard III’s or not. The results are expected in 10-12 weeks. They could prove to be a very welcome Yuletide present to those who want to get to the truth about this controversial king, and possibly restore his maligned reputation. It will be interesting to see how this turns out. Meanwhile, I can think of several other great historical villains who perhaps do not deserve their reputation.